Antenna tuners do not tune the antenna, in the sense of shifting the resonance frequency of an antenna to the operating frequency of the transmitter. Antenna tuners cannot change the feedpoint impedance of an antenna. Antenna tuners cannot change the impedance along the feedline between the tuner and the antenna. Hence, an antenna tuner cannot change the SWR along that feedline between the tuner and the antenna. An antenna tuner can, however, change the load impedance that appears at its connector to the transmitter. Hence, it changes the matching at the transmitter. 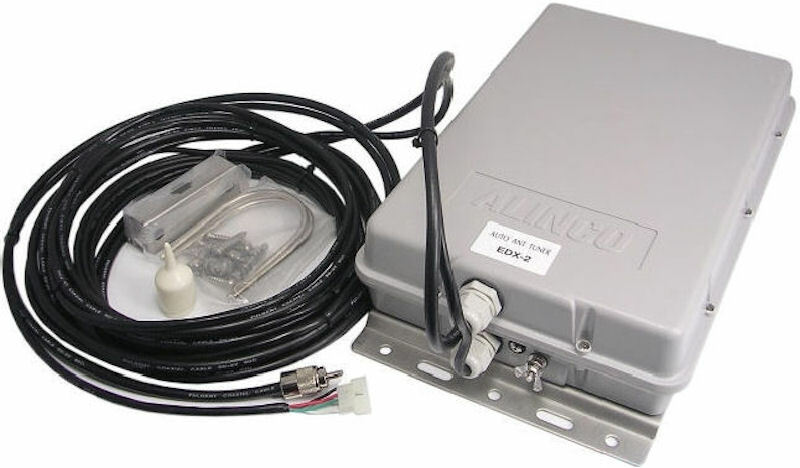 Conversely, an antenna tuner can and does change the source impedance that appears at its connector to the feedline to the antenna. Hence, it changes the matching at the feedpoint of the antenna. The function of a "tuner" is to provide impedance matching for the purpose of maximizing power transfer between the transmitter/transceiver and the antenna system ( = antenna + feedline). A tuner/coupler is only a "local impedance transformer". It provides (or improves) impedance matching only at the point where it is inserted into the feedline. All other impedance mismatches elsewhere along the feedline (and associated losses) to the antenna are not corrected! Simply put: cancel out the non-resistive (i.e., inductive, capacitive) part of its load impedance, and transform the resulting purely resistive impedance to 50 ohm ( = "matching"). So, it would be more appropriate to call a tuner/coupler an "impedance matching unit". 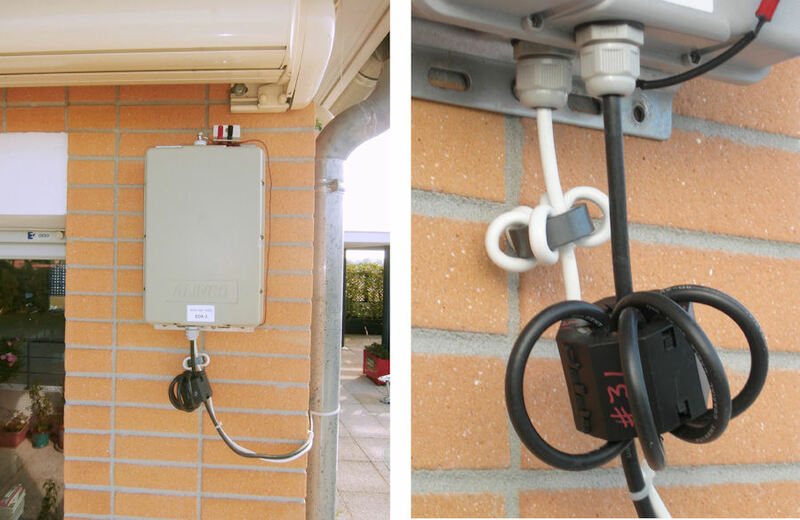 In principle, a "tuner" can be inserted anywhere along the feedline between the transmitter and the antenna. If it is placed directly at the antenna, it is often referred to as an "antenna coupler". Here, the "tuner" matches the impedance of the antenna to the characteristic impedance of the coax-feedline between the tuner and the transmitter. This minimizes feed-line losses. Obviously, if the tuner is located at the antenna, it must have remote control. Typically such remote tuners/couplers are automatic: the transmitter outputs a low-power carrier, and the tuner does its thing. 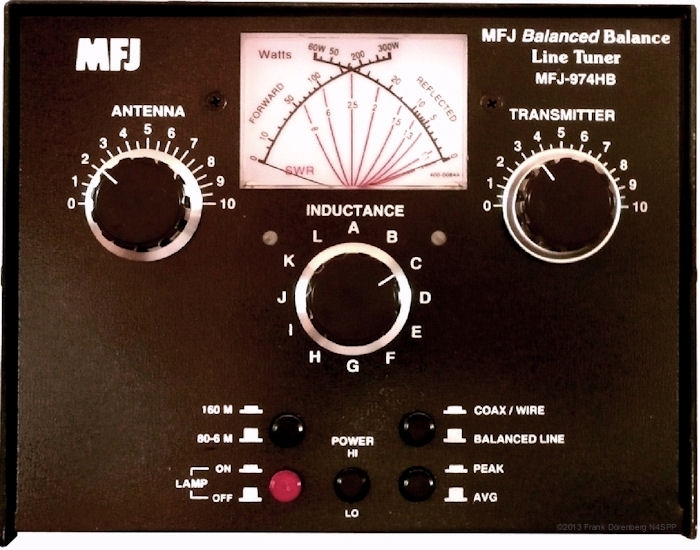 When the tuner is located closer to, or at the transmitter, it may very well be able to provide perfect impedance matching between the transmitter, and the "feed-line + antenna" system. The feed-line may be balanced (ladder line, twin-lead), or unbalanced (coax). Whereas the transmitter may be very happy in this configuration and see SWR 1:1, feed-line losses may actually be (very) high: a tuner that is not inserted at the antenne feedpoint does not correct the mismatch between the feedline and the antenna. The larger the impedance mismatch that the tuner/coupler has to correct, the larger the tuner/coupler losses. These losses may be a very significant part of the transmitter output power! Listed and described below, are the "tuners" that I have acquired over the years. 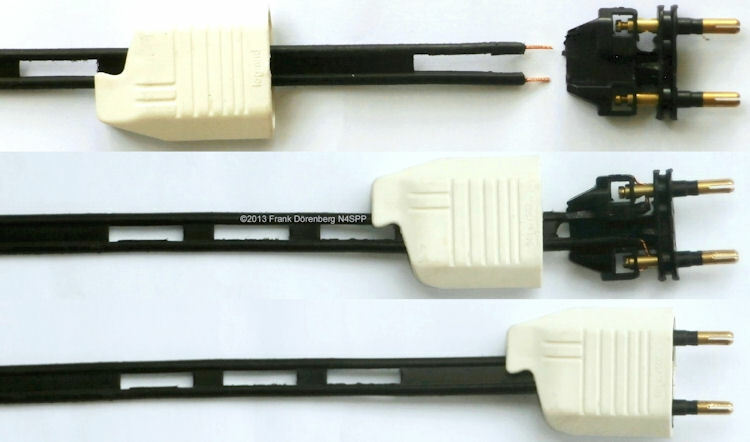 Until mid-2011, I have been using a simple manual antenna tuner directly at the transceiver. 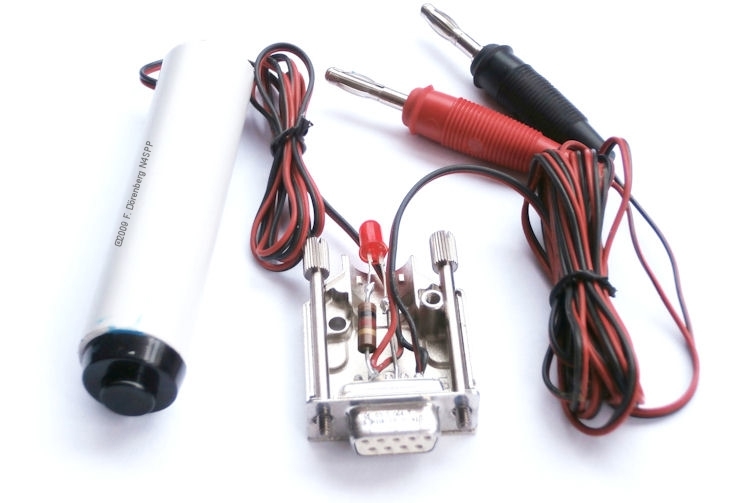 I have used it with coax, and with 300/450 Ω ladder line (sometimes via 1:1 and 4:1 baluns at the antenna). 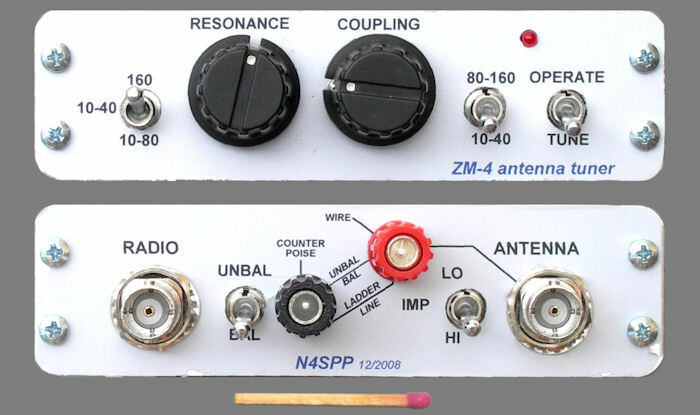 In December of 2008, I built a small QRP antenna tuner kit (10 W max): the ZM-4 from QRPproject in Germany (ref. 2C). It has both a balanced and an unbalanced antenna input, and an LED indicator instead of an SWR-meter. It is a very compact Z-Match. Ref. 2D. If you want to print the labels that I designed: a printable file is provided at the end of ref. 2C. Early 2011 I decided to have a go at an "Automatic Antenna Tuner" (ATU) antenna coupler. My rig is an Alinco DX70TH, so I started looking for the matching Alinco EDX-2 tuner. Ref. 4. The EDX-2 supposedly "tunes" just about any "element" that is over 10 feet (3 m) long, from 3.5-30 MHz (80-10m) band, and anything over 40 feet (12 m) from 1.8-30 MHz (160-10m). Note that the ability of the coupler to "load" a random piece of metal at a certain frequency does not imply whatsoever, that the "antenna" will radiate efficiently. The EDX-2 is very similar in design and construction to the Icom AH-4. The effect of the automatic tuning is fun to watch - on the S-meter of my old MFJ-tuner (yes, in bypass mode). The 4-conductor control cable between the EDX-2 and the transceiver has the perfect length for capturing interference from the antenna while transmitting. That would not be good! So I looped the control cable several times through two FT140-43 ferrite rings: one at the EDX-2, one at the transceiver. I have also installed a current choke at the EDX-2 end of the coax - just in case. I used a large (!) clamp-on ferrite of material type 31- supposedly significantly better below 5 MHz than the #43 material. 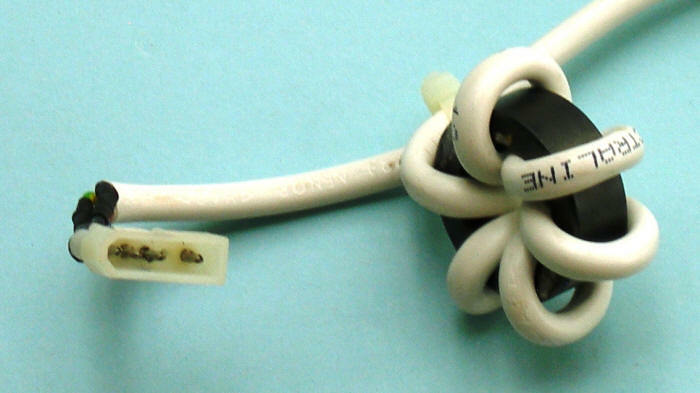 The core of this "split round cable assembly" (or "Round Cable Snap-It") is about 2.2" (≈5.6 cm) tall and across. These days, I connect dipole antennas to this tuner/coupler via a section of 300 ohm twin-lead. To make it easy to connect/disconnect antennas durng experiments, I use a regular 220 Volt household plug instead of banana plugs. Do not use this method near a 110/220 Volt power outlet! T0: the operator activates the "tune" function on the DX-70 transceiver. 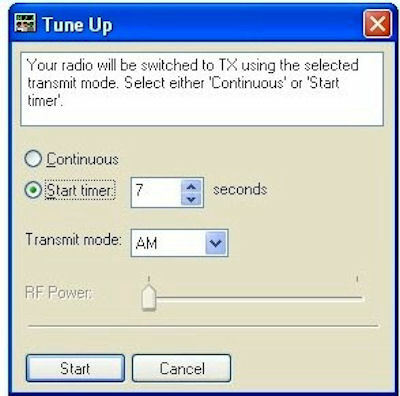 The transceiver asserts the active-low ( = pull-down) START signal to the EDX-2. In the EDX-2, the START input is pulled up to +5 VDC. Pull-down in the DX-70 is open-collector. T1 = T0 + 15 msec: the EDX-2 responds by asserting the active-low KEY signal to the EDX-2. In the DX-70, the KEY input is pulled up to +5 VDC. Pull-down in the EDX-2 is open-collector. T2 = T1 + 2 msec: in response to the active KEY signal, the DX-70 sends a carrier (3-10 watt). T3 = T2 + Ttune: the EDX-2 tunes (typ. 3-8 sec). upon finishing the tuning process, the EDX-2 relinquishes the KEY signal to the transmitter. T4 = T4 + 8 msec: the transmitter relinquishes the START signal and stops transmitting the carrier. If the transmitter does not send (sufficient) RF, the RDX-2 relinquishes the KEY signal 330 msec after activating that signal. 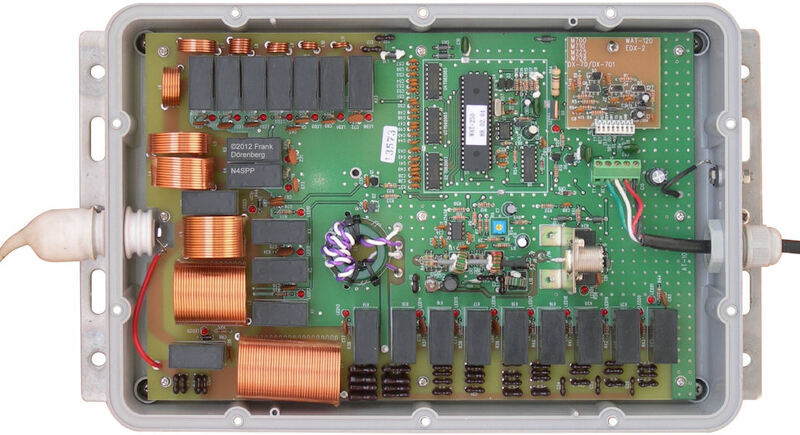 In 2012, I acquired a very compact QRP HF/VHF/UHF transceiver: a Yeasu FT-817ND. I really wanted to use it with the EDX-2. However, the FT-817 does not have a "tune" button or function! Performing a manual „tune“ takes 5-11 manipulations on the FT-817, depending on the mode that the transceiver is in. Very annoying! But don't despair! I use the Ham Radio Deluxe (HRD) digi-mode software package (I still use the V5.11 freeware version) to fully control the FT-817 via a CAT-interface. HRD has a tune-function ("tools" ─► "tune up"). However, HRD has no way to assert a START signal to the EDX-2 or to respond to the KEY signal from the EDX-2. So, no automatic tuning cycle. Not a big problem. There is an easy way to manually assert the START signal to the EDX-2. The EDX-2 control cable is disconnected from the DX-70 transceiver, and a push button switch is installed across the START wire and ground. An LED with pull-up resistor is connected to the KEY wire of the control cable, so we can see what the EDX-2 is doing. See the schematic below. I just activate the tune function of HRD and immediately hit the push button. That's all. Not fully automatic, but hey.... it works like a charm! series inductance per unit of length, denoted L0. loss resistance per unit of length, R0, in series with inductance L0. parallel capacitance per unit of length, denoted C0. leakage conductance per unit of length, G0, parallel to the capacitance C0. This is the reciprocal of the loss resistance in the dielectric between the two conductors of the transmission line. Note that this is independent of frequency and independent of the length of the transmission line! Coax cable is typically dimensioned and constructed such that Z0 is 50 ohms (or 75 ohms for TV and satellite receiver coax). For twin-lead cable and window-line, standard Z0 is 300 or 450 ohms. The Z0 of ladder-line also depends on the wire spacing, wire diameter, and wire insulation material. Such line is often dimensioned for 450, 600 ohm, or more. What happens, if a transmitter inserts a signal into the input end of the transmission line, but the transmission line is not terminated with a load impedance ZL that is equal to the line's characteristic impedance Z0. That is, ZL ≠ Z0. This impedance mismatch causes an impedance discontinuity at the output end of the transmission line. Part (or even all) of the input signal ("wave") is reflected at that discontinuity - just like a mirror. The forward "wave" (also referred to as "incident wave") and the reflected wave travel in opposite directions. They combine into an interference pattern. For simplicity and illustration purposes, let's assume that the input signal is a constant sinewave. The forward and reflected waves have the same frequency (wavelength). The resulting pattern is then called a standing wave. Unlike the forward and reflected waves, the standing wave does not travel along the transmission line: it is stationary ( = standing still). The wavelength of the standing wave is the same as that of the forward wave and of the reflected wave. Hence, the amplitude pattern of the standing wave repeats itself every full wavelength. As explained below, we are actually only interested in the absolute amplitude of the standing wave. Its pattern repeats itself every half wavelength. Obviously, the reflection cannot be more than 100% if the load is passive. If it is less than 100%, then the reflected wave has an amplitude that is less than the amplitude of the forward wave. The resulting standing wave now has a maximum voltage amplitude |Vmax| that is less than twice the amplitude of the forward wave. Likewise, this standing wave has a minimum voltage amplitude |Vmin| that is non-zero, but never larger than the amplitude of the forward wave. The opposite extreme case is 0% reflection. In this case, there is no standing wave, and the forward power wave is completely absorbed in the load. This is what we want! SWR is always in the range [1,∞] because |Vmin| cannot exceed |Vmax| and cannot be less than zero (since it is an abolute value). 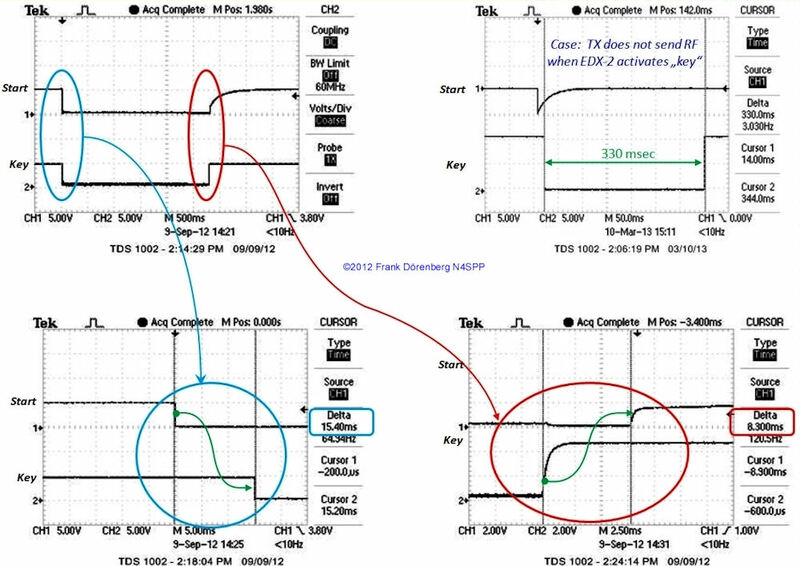 Keep in mind that true |Vmax| and |Vmin| are only found if the transmission line is at least half a wavelength long. A line that is shorter than that, will only have a local minimum and/or maximum. This local minimum may not be as small as the global minimum of a sufficiently long transmission line. Likewise, the local maximum may not be as large as the global maximum of a sufficiently long line. But based on the definition of SWR, this does not affect the SWR. The reader may verify that for a purely resistive load equal to the characteristic impedance of the feed line, i.e., Zload = Rload = Z0, we obtain SWR = 1. We have seen that SWR is related to "reflection" at the load end of the transmission line. In fact, it is directly related to the reflection coefficient, usually denoted Γ (capital letter Gamma). In general, Zload is a complex impedance, so the the parameter Γ is a complex number that has a magnitude |Γ| which is often denoted ρ (rho), and a phase angle. |Γ| is always in the range of [0,+1]. When a forward wave with amplitude Vforward is reflected at the load-end of the transmission line, then the reflected wave has an amplitude Vreflected = Γ·Vforward. In general, Γ is a complex number. If the transmission line is terminated with Zload = Z0, then there is no impedance mis-match and no reflection, hence Γ = 0. Termination with a short circuit (i.e., Zload = 0) results in Γ = -1. That is, 100% reflection, with opposite polarity. Termination with an open circuit (Zload = ∞) results in Γ = +1. That is, 100% reflection, with same polarity. When a forward wave with amplitude Vforward is reflected at the load-end of the transmission line, then the reflected wave has an amplitude Vreflected = Γ·Vforward. In general, Γ is a complex number. If the transmission line is terminated with Zload = Z0, then there is no impedance mis-match and no reflection, hence Γ = 0. Termination with a short circuit (Zload = 0) results in Γ = -1. That is, 100% reflection, with opposite polarity. Termination with an open circuit (Zload = ∞) results in Γ = +1. That is, 100% reflection, with same polarity. So, (V)SWR can be determined by measuring the ratio of reflected power and foward power. This requires a measurement instrument that can distinguish between these two directional power flows, and can measure both simultaneously. Note that the better the impedance match at the load-end of the transmission line, the smaller the reflection and |Γ|, so the higher RL ! Yes, this is rather counter-intuitive. But keep in mind: RL represents reduction ( = loss) of the reflection, not loss (of the forward wave) caused by reflection! RL is always in the range of [0, +∞], based on the definition and |Γ| always being in the range of [0,+1]. S11 is one of the four S-parameters (S11, S12. S21, S22) that are used in network analysis to characterize two-port networks such as transmission lines. Ref. 5C, 5D. The ratio is inverted as necessary, such that the SWR is never less than 1, which represents perfect matching. It can not be changed by changing the length of the feedline! an impedance bridge circuit that is only balanced when the measured impedance matches the reference impedance in the bridge. The SWR instrument mis-reads due to RF interference. The SWR meter is an impedance bridge, so it can only measure the ratio of the local impedance and Z0. IThe SWR meter senses forward and reflected current with a directional coupler, but the directivity discrimination of the coupler is not perfect. Directivity should typically be at least 15 dB, to reduce the power measurement error to less than about 1 dB. The instrument does not measure at least not for the actual Z0 of the transmission line. The actual Z0 of the transmission line is not exactly the Z0 for which the SWR meter is designed and calibrated. Note that, e.g., "50 ohms" coax is not "50.0 + j·0", but often around 52 ohms with some non-zero reactance. 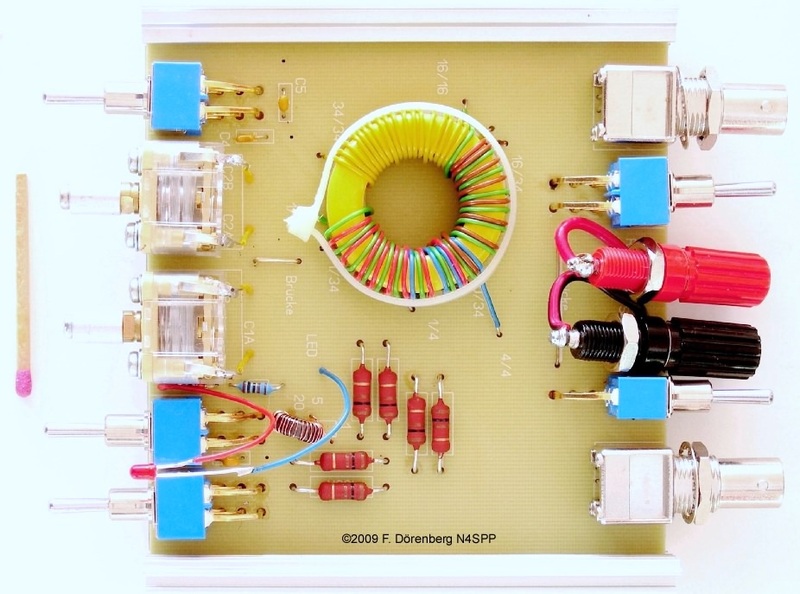 Note that the "50 ohms" output of a solid-state transmitter or transceiver is rarerly 50 ohms. This may explain some discrepancies between SWR-readings by the internal SWR-meter of transmitters/transceivers and external meters. Depends on whether we are only interested in keeping the transmitter happy by loading its output with the proper impedance (e.g, 50 ohms), independent of the transmission line SWR, or we also want to match the antenna to the tranmission line, in order to minimize transmission line losses. The only point along the transmission line where conventional SWR meters . SWR is highest closest to the load, and only "improves" as the distance from the load increases, creating the false impression of a matched system. Note: it is very important to always make clear which SWR we are talking about: SWR(Z0) or "measured SWR", which is also referred to as "true SWR", and SWR(True). Conventional SWR-meters measure the ratio of the local impedance (at the antenna/output connector of the meter) , and the reference impedance that the meter is designed for (and hopefully calibrated to), typ. 50 ohm. Obviously, it cannot do a remote measurement of the load-impedance Zload. Likewise, it cannot measure the maximum and minimum voltage (or current) along the transmission line. So, such an instrument can only measure the Zload / Z0 ratio, if it is placed at the antenna feedpoint! Note that a VNA does not measure a local impedance: it measures the reflection coefficient. The magnitude of that coefficient is directly related to the SWR. Note: whereas (by definition) SWR is a constant that is independent of the length of the transmission line, the impedance along that line is not constant, unless the impedance Zload of the load ( = antenna feedpoint) is equal to Z0. With antennas, this hardly ever the case! If ZL ≠ Z0, then the transmission line acts as an impedance transformer: the local impedance depends on the distance (in wavelengths) from the load-end. This means that the impedance at the input-end changes when the cable length is changed. These changes may be very large. "Impedance" SWR-meters may interpret this change as an SWR change. So: what happens if a coax is terminated with an impedance that is not a pure 50 ohm resistor? The answer is....... that depends! It depends on that termination impedance, and on the length of the coax. To be more precise: not the physical length of the line, but the electrical length. The latter is a function of the Velocity Factor (VF) of the line, and the frequency of the transmitted signal. VF depends on the dimensions of the line and the type of dielectric. In a coax cable, the dielectric is the material between the center conductor and the shield. VF is typ. around 0.66 for coax with solid polyethylene, and 0.8 - 0.88 with foam polyethylene. The wavelength in the cable is equal to the "free space" wavelength of the signal, multiplied by the VF. Example: a frequency of 10 MHz is equivalent to a free-space wavelength of 30 meters. In a coax cable with a VF of 0.8 ( = 80%), a 10 MHz signal has a wavelength of 30 x 0.8 = 24 meters. Conversely, a cable with VF=0.8 and a physical length Lphys of 1 wavelength λ, has an electrical length Lelec = λ / 0.8 = 1.25 Lphys. Note that it is tacitly assumed that the VF is frequency-independent constant, which is a simplification. So, an "open"at the load-end (Zload = ∞) is transformed to a "short" at the input-end (Zinput = 0). Likewise, a "short" (Zload = 0) appears as an "open" (Zinput = ∞). Any other load-impedance is transformed per the ratio shown in the formula above. The two figures above show that the pattern repeats itself every 1/2 electrical wavelength. Of course, for loads with a reactive component, the calculation is a bit more complicated, as obvious from the general formula for Zinput. Matched Line Loss (MLL): this is the power loss in a length of transmission line when it is perfectly matched by the load. It is typically characterized as dB for a given physical length, typically dB/100 ft or dB/100 m. It depends on the general line type (coax, twin-lead, wondow, ladder line), the specific model and manufacturer. MML is also frequency dependent: the higher the frequency, the higher the loss. See the attenuation graph below. Additional loss due to SWR. This loss can be much higher than the MML! Impedance matching unit (antenna coupler or "tuner"). In general, the larger the mismatch to be matched, the larger the loss. This loss can be very significant (i.e., more than 50%)! Impedance transformers (baluns, ununs, common-mode chokes,...). Reflected losses, due to impedance mismatch between connector and Z0. Dielectric losses, due to dissipation in the dielectric materials of the connector. "Copper" losses, due to dissipation in the conducting surfaces of the connector (base metal such as copper, brass, steel; plating such as gold, silver, nickel). The design of the front & back labels that I made is here. I printed the labels on a sheet of self-adhesive paper (actually a sheet with several large labels for file binders). Before you print on adhesive paper, print on regular paper and check the size of the labels: my file is set up for the printer that I use. You may have to adjust the printing scale in the printer settings, to get the correct scaling for your printer. After printing, I applied a thin layer of clear matt acrylic coating (e.g., from arts & crafts supply store) to protect the paper. Ref. 4A: "EDX-2 Automatic Antenna Tuner", Alinco, Inc., operating/installation manual, 2 pp. Ref. 4B: "EDX-2 Service manual", Alinco, Inc.
Ref. 4D: "Smartuners for stealth antennas", SGC Inc., 1997, 35 pp. Ref. 4E: "SG-230 Smartuner Installation and Operations Manual", SGC, Inc., 2000, 81 pp. Ref. 5E: "Transmission Lines - Your Pipeline to the Outside World", Jim Fisk (W1HR), in "Ham Radio Horizon" (HRH), May 1977, pp. 32-39. Calculates impedance and reflection coefficient parameters (SWR, reflection coefficient) at both ends of a transmission line, and the details of power loss in the line (Matched Line Loss), electrical length, etc. Includes built-in specifications for approximately 100 different line types.